Fairfax City Hall is located at 10455 Armstrong Street, Fairfax, VA 22030; phone: 703-385-7855. Photo: Hope Park Mill and Millers House, ca. 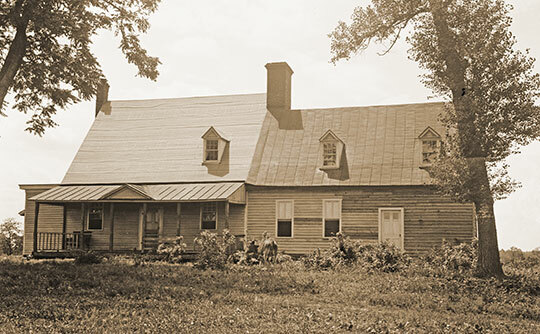 1800, 11807 Pope's Head Road, Fairfax, VA. 1936, Historic American Buildings Survey [HABS VA-1006], loc.gov/pictures/item/va0411.photos.161380p/, accessed September, 2016. Fairfax is an Independent City and the seat of Fairfax County. The area that now comprises the City of Fairfax was first settled in the early-to-mid-1700s by farmers pushing out from the Tidewater region of Virginia and by Marylanders crossing the Potomac into Virginia for economic and religious reasons. Initially it was a part of Truro Parish, and became a part of Fairfax County when the County was established in 1742. When Fairfax County was first formed, a court was established at a place called Freedom Hill near the present-day Tyson's Corner. The court remained there for only ten years, and was relocated to Alexandria in 1752 because of the growing importance of Alexandria as a port city and for protection from Indian raids. In 1800, it became necessary once again to relocate the County court due to congressional legislation that proposed to include Alexandria in the new Federal capital. A site at the junction of Ox Road and Little River Turnpike was selected as the location for the new County courthouse. Ox Road had originally been an Indian trail that was widened by King Carter's men in order to gain easier access to copper deposits found in the northern regions of the County. Little River Turnpike was a private venture of the Little River Turnpike Company, which was authorized by turnpike charter to build and operate for profit a road from Alexandria to the ford of the Little River in Aldie, Virginia. Thus, in 1799 the Fairfax County Court was moved from Alexandria and established at this site, then known as Earp's Corner. A new courthouse was built on a two-acre parcel of land conveyed to the Court by Richard Ratcliffe, a prosperous resident of the area, for the sum of one dollar. Completed in 1800, that courthouse remains today as the north wing of the historic Fairfax County Courthouse complex. A small village soon grew up around the courthouse and, by an Act of the Virginia legislature in 1805, the village was incorporated as the Town of Providence—even though it was generally referred to as Fairfax Court House. The original town consisted of 14 acres of land subdivided into one-half acre lots. The lots were then sold at a public auction with the stipulation that a house at least 16 feet square with a brick or stone chimney be built and ready for habitation within seven years from the date of sale. Throughout the early 1800s, the town remained small, but it prospered due to the presence of the court and to the heavy traffic along Ox Road and Little River Turnpike. By 1835, the Town of Providence consisted of approximately 50 houses, the county buildings, three mercantile stores, four taverns, and one common school. In 1850, the name of "Fairfax," a name abandoned by the renamed Town of Culpeper, was selected for the town, although this action was not ratified by the General Assembly until 1874. Fairfax was the scene of several notable events during the Civil War. Captain John Quincy Marr, the first officer fatality of the Confederacy, was killed at Fairfax Court House on June 1, 1861. By late 1862, the town was occupied by Union forces commanded by Brigadier General Edwin H. Stoughton. In a daring raid led by Confederate Lieutenant (later Colonel) John S. Mosby in March 1863, General Stoughton was captured while he slept in a house that is the present-day rectory of Truro Church. Also in 1863, Antonia Ford, whose girlhood home was the Ford Building on Chain Bridge Road, was imprisoned as a spy for aiding Confederate General J.E.B. Stuart. After 1865, Fairfax and the rest of Northern Virginia set about repairing the ravages of war. The Town of Fairfax continued to serve as the governmental seat of Fairfax County, which had become an area of prosperous farms and estates. Several of the homes that were part of nearby farms or country estates are now within the boundaries of the present City of Fairfax. In 1900, the Town of Fairfax was a community of farms and small estates with a total population of about 400 persons. It contained one bank, a hotel, a drug store, a carriage and wagon factory, a newspaper office and several general stores. These businesses were concentrated primarily on Main Street between what is now Chain Bridge Road and East Street. In addition, the Town included several churches, a school and lodges. In 1904, the Washington, Arlington and Falls Church electric railway was completed. Its terminus was located at the abandoned Wilcoxen Hotel on Main Street near the County Courthouse. The advent of this important transportation link helped to revive the economy of Fairfax both in terms of new commercial development in the downtown area and as a quick and convenient means for transporting dairy products to distribution centers in Washington. It also brought about the first wave of suburbanization as more county residents were able to work in Washington while residing in the suburbs. Other transportation improvements continued to fuel the suburbanization of the County. After World War I, bus lines were established and automobiles became an increasingly popular means of transportation. As a result, new and better roads were being demanded. In 1935, Lee Highway was extended westward from Fairfax Circle to Kamp Washington. In the 1930s and 1940s, the growth of employment opportunities with the Federal Government, coupled with improvements to the area's transportation system, further reinforced the suburbanization trend. Even with the closing of the electric railway in 1939, the Town continued to grow. Between 1940 and 1950, the Town's population doubled to almost 2,000 persons. In the 1950s, the population of the Washington metropolitan area began growing rapidly and the movement of this population to the suburbs accelerated. This was also a significant period in the history of the City's planning and growth. Between 1955 and 1960, the Town of Fairfax annexed land to the east, north and west, expanding its boundaries from 2.5 square miles to approximately six square miles. Consequently, the number of housing units in the Town increased from approximately 1,400 to 3,700. In 1961, under a charter granted by the Virginia General Assembly, the Town incorporated as an independent city. This action was sought by the Town in response to the then pending incorporation of Fairfax County as an independent city, an action that would have deprived the Town of its autonomy. At that time, the City contained 3,688 housing units and a population of 14,434 persons. Despite the City's independent status, it elected to enter into a number of contracts with Fairfax County for the provision of public services, including education. In addition, a 1965 agreement established a 50-acre "County enclave" surrounded by the City, which included the County Courthouse/Massey Building area. During the 1960s, many of the City's larger properties, including some farms near Main Street, were developed or redeveloped. One large dairy farm on Pickett Road was sold for use as an oil tank farm, which continues to be the single largest industrial development in the City. New types of housing were built for the first time in the City in the 1960s. Between 1960 and 1966, 16 apartment complexes were built containing a total of 2,000 units. In the late 1960s, four residential townhouse developments were built in the City with a total of 355 units. Nonetheless, single-family residences remained the City's predominant land use. The City also experienced rapid growth in commercial development in the 1960s. During that time, seven small office buildings were constructed in the City's downtown area and some older downtown residences were converted to office uses. The City Hall was also built during that period, as was the controversial 12-story Massey Building in the County's governmental complex. City of Fairfax Virginia Planning Commission, City of Fairfax Comprehensive Plan: Moving Fairfax Forward, 2012, www.fairfaxva.gov, accessed August, 2012.